Getting around Westwood in southwest Denver without a car is not safe, let alone pleasant or convenient. You have to contend with wide, high-speed streets and thin, crumbling sidewalks — where sidewalks exist at all. Motorists zoom down Federal, Sheridan, Kentucky, Alameda, and Morrison Road with little regard for the lives of people pushing strollers or walking to the bus stop. Now a new neighborhood plan from Community Planning and Development — the first in 30 years — aims to make Westwood’s streets safe for walking and biking and convenient for transit riders [PDF]. Few neighborhoods in the city would benefit more from improvements to walking, biking, and transit. About 60 percent of Westwood households have children, and 35 percent live below the poverty line, compared to 20 percent citywide — indicating that a higher than average share of people in this predominantly Latino neighborhood depend on travel options other than private cars. Westwood is dense, too, with 16 residents per acre, compared to an average of six citywide. Below are some highlights from the transportation sections of the plan (which also delves into housing, parks, and how to keep the neighborhood affordable). There are a lot of good ideas here, but in the end, it’s still just a plan. Once City Council passes it later this summer, it will be up to Mayor Michael Hancock to fund these recommendations. Curb extensions, chicanes (brief curved sections on otherwise straight streets), and traffic circles to engineer safer driving habits into the street. Narrower travel lanes on Federal and Alameda. Colored, decorated, and/or textured crosswalks that grab drivers’ attention, plus signs indicating pedestrian crossings. All-way stops for vehicles at intersections with heavy pedestrian traffic. Safety improvements on walking routes to schools will be prioritized. More street lighting, tree lawns, and benches. Westwood’s streets should be easy to bike “for a wide-range of novice and experienced cyclists,” the city says. Planners float the idea of turning the striped bike lane on Morrison Road into a protected bike lane once ridership increases, but why wait? The way to increase ridership is to provide a comfortable place to bike. 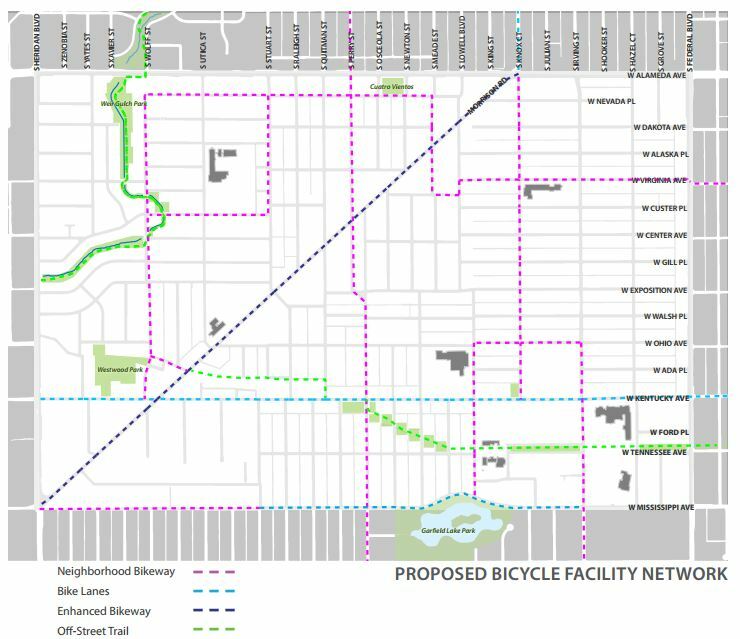 “Neighborhood bikeways” — streets that prioritize bike traffic by slowing down cars while letting cyclists proceed with as few stops as possible — on Wolff Street, Perry Street, Nevada Place, and Mississippi Avenue. A bike lane on Kentucky Avenue. Signal timing to prioritize bikes, bike boxes (waiting areas in front of of the car queue at lights), and directional markings for bicyclists at high-traffic intersections. Neighborhood programs that “remove barriers to biking” like bike clinics and paths to bike ownership through partnerships with nonprofits and businesses. 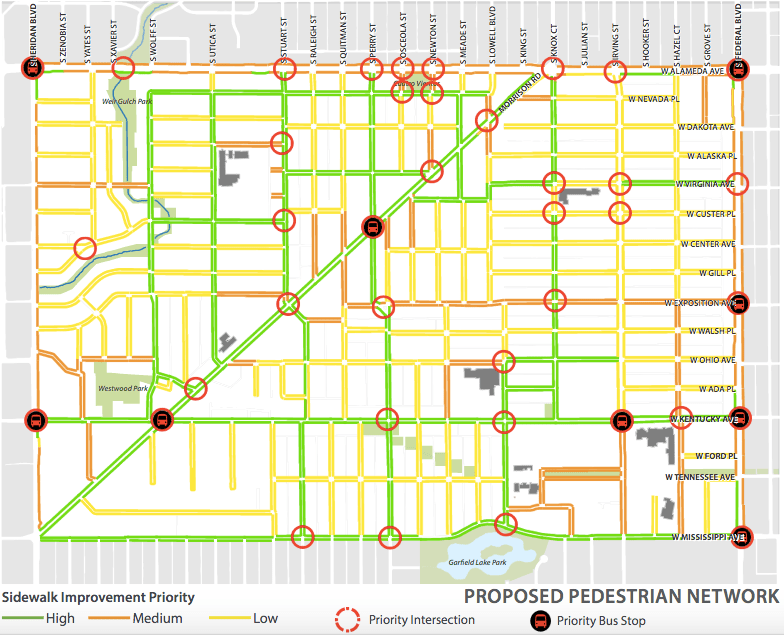 The plan’s biggest idea is creating a transit-only lane on Federal Boulevard, along with signals that prioritize buses at intersections. Good first-and-last-mile connections — the routes to and from transit stops — are also prominent in the Westwood plan, but are largely covered in the pedestrian and bicycle sections. Covered waiting areas, benches, and real-time bus information at high-traffic bus stops. Programs to encourage more employer-sponsored RTD passes. Compact development that complements transit. Programs to increase ride-sharing, pop-up transit services like Bridj. Nice article David. Thanks. This is an area that should be placed high on the list of priorities for improved walking, biking and transit access. Just looking at the last picture, I can see a lot of easy improvements. The bus stops are too close to the intersection. Pulling them back would allow the crosswalks to be perpendicular to the street, and much shorter. The stop lines should be perpendicular to the curbs. The radius of the curbs is to big. The corners should be pointier. For example, the corner on the lower right (SW?) 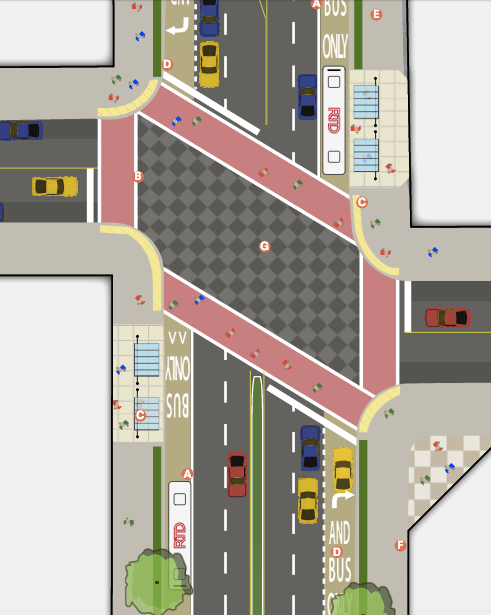 should extend to the intersection of the white delineations of the crosswalk. But see the next point. The side streets have parking lanes. There should be bulbouts on the extensions of those lanes into the intersection. The median should extend beyond the crosswalk, not stop just before it. The is no need for the median outside the intersection. It should end at the end of the bus stop in favor of wider sidewalks. This would put a wiggle into the driving lanes, increasing safety.